From the kitchen that brought us the I-have-never-seen-anything-yummier Grilled Cheese comes the it-just-got-yummier Macaroni & Cheese. The kid-friendly favorite is now being spotted at the trendiest restaurants around town, and this fantastic cookbook has it all. 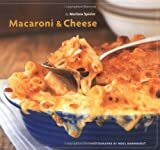 More than 50 classics range from the tried-and-true Yankee Doodle Dandy Baked Macaroni and Cheese and quick to prepare specialties such as the yodel-worthy Alpine Macaroni with Appenzeller and Crème Fraîche to international specialties like Giuvetchi, a Greek dish of orzo in a cinnamon tomato sauce with lamb and kasseri, myzithra, and feta cheeses. There are even a few dessert versions like Falooda, a traditional Indian treat, this one using ricotta and sweet vermicelli, with cherries and a touch of cardamom. Recipes for side salads and soups help round out a balanced meal. Mac & cheese—it'll always please.